The octoBox testbed can reduce the time it takes to run through a series of MIMO-OTA throughput and complex mesh tests from days to hours. octoScope® today announced Kyrio, a provider of unique testing solutions for network technology services, will use its octoBox® personal testbeds in their testing services. As an independent and vendor-neutral testing laboratory, Kyrio offers services to support a wide variety of industries to deliver reliable and interoperable end-user performances. With the addition of the octoBox personal testbeds, Kyrio is now able to help device manufacturers thoroughly and economically refine their products to produce top performances. The octoBox® product line includes the STACK-BENCHTOP, STACK-16 and STACK-SNB personal testbeds, which emulate real-life wireless environments and range in size from a desktop/benchtop model to refrigerator-sized testbeds on wheels. The compact size of the octoBox enables wireless test and development engineers to perform fast, comprehensive and repeatable testing without the need for large isolation chambers. octoScope is the market leader in accurate and repeatable automated wireless personal testbeds. Our patented technology redefines the accuracy, stability, economics and value of over-the-air wireless testing. 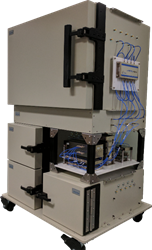 octoScope’s product line includes the octoBox testbeds with robust solutions for isolation, interference generation and evaluation, client emulation, and essentially all the elements required to evaluate the behavior and performance of a broad range of wireless devices and systems. octoScope’s headquarters is in Littleton, Massachusetts. Watch our new octoBox personal testbed video at Kyrio's Lab to see how customers use the testbed.